Bus from Melaka to Kota Bahru is the most direct transport as compared to taking flight and taking train. Because of no train and flight service in Melaka, passengers need to take bus either to Kuala Lumpur airport for flight or to Tampin KTM station for train. Therefore, taking flight or train is not as convenient as taking bus to Kota Bharu. Perdana Express and Transnasional are the two popular coach companies running bus from Malacca to Kota Bahru. They have good reputation in service and punctuality. Perdana Express and Transnasional both deploy VIP coach to serve their passengers. VIP coach seating is arranging in 3-seat-in-a-row seat layout. This layout gives advantage of spacious seat and big leg room. Hence passengers taking this coach could sleep through the night during the journey. The bus fare of bus from Malacca to Kota Bahru is charged at about RM 57.00. 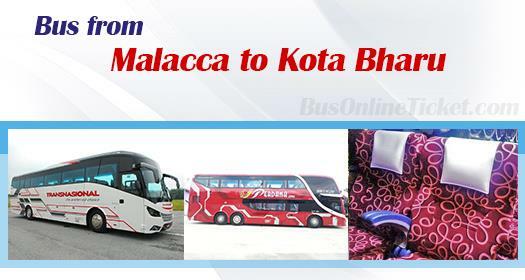 Duration required for bus from Malacca to Kota Bahru is about 9 hours depending on traffic condition. 1 Washroom break will be provided during the journey. The boarding point in Melaka is at Melaka Sentral Bus Terminal. Melaka Sentral is easily accessible by taking taxi or city bus in Melaka town. The arrival point in Kota Bahru is at Kota Bahru Bus Terminal located next to Tesco and the new Aeon Mall. Perdana Express and Transnasional both offer daily bus trip at 8pm only. Therefore, advance online booking is recommended to passengers to secure ticket before departure. Online booking for bus from Melaka to Kota Bharu is now available at BusOnlineTicket.com. You just need to go online to do online booking and make payment in BusOnlineTicket.com to get instant confirmation booking. Grab your bus ticket now at BusOnlineTicket!